Knitting Pattern by B. Hooked Knitting, Copyright 2017. Please do not copy, sell, redistribute or republish this pattern. If you wish to share this pattern, link to this page only. You may sell items produced using this pattern. Do NOT use the copyrighted photos for your product listing. Disclosure: Please note that the links below are affiliate links, and at no additional cost to you, I will earn a small commission if you decide to purchase your supplies online. Please understand that I have experience with these products and I recommend them because they are optimal for this pattern, not because of the small commissions I make if you decide to buy them online. If you have received valuable information from me at any point, this is one easy way to say thank you for a job well done! Don’t have Amazon Prime? Don’t pay for shipping, start your free 30-day trial on me! My husband and I have been Amazon Prime members for years. We order all of our household supplies, gifts, crochet supplies and even some food items from Amazon. We wouldn’t be able to save money if we had to pay for shipping. Amazon Prime members get free two day shipping on eligible Prime items plus a ton of other perks such as free movie and TV show streaming and free music streaming. If you’ve been thinking about getting an Amazon Prime membership, how about you start with a free 30-day trial on me? It’s the least I can do for your support! This adorable Cutie Pie baby knit headband is available in two sizes, 0-3 months and 3-6 months. 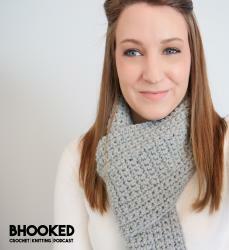 You can easily adapt this pattern for a larger size by increasing the length of your headband. These three videos cover the entire process of knitting this pattern. Feel free to leave comments below with any questions! This video is also available in a left handed version. Click here to be directed to the left handed tutorial on my YouTube channel. Row 2: k first stitch. P to last stitch. k last stitch. Rep rows 1 and two until your headband measures 13″ for 0-3 mos size or 15″ for 3-6 mos size. Bind off. Sew the two ends together with the mattress stitch. Thread your darning needle and feel a new piece of yarn through your button holes. Attach the button at the seam by pulling it tight and tying the button around the headband to secure it.